Vying for the title of "World's Greatest Villain", Gru (voiced by Steve Carell) – along with his hilarious crew of mischievous minions – plots to pull off the craziest crime of the century: steal the moon! But when Gru enlists the help of three little girls, they see something in him nobody else has ever seen: the perfect dad. From executive producer Chris Meledandri (Dr. Seuss' Horton Hears a Who!, Ice Age, Ice Age: The Meltdown), and featuring the voices of an all-star comedic cast, including Jason Segel, Russell Brand, Miranda Cosgrove and Julie Andrews, Despicable Me is "rousingly funny, heartfelt and imaginative" (Pete Hammond, Boxoffice Magazine). Available on DVD & Blu-ray™ December 14, 2010! "Minion Madness is designed to deliver a unique experience that is both interactive and entertaining, ensuring that audiences of all ages have the opportunity to enjoy Despicable Me in a fun and memorable way throughout the holidays." Lifetime, all-access passes to Universal Studios theme parks. Family trip to New York City for the 2011 Macy's Thanksgiving Day Parade. Luxurious family vacation to Los Angeles complete with hotel stays and spa visits. Once officially registered online as "Masterminds" on http://www.minionmadness.com/ , players earn chances to win prizes by participating in an array of entertaining and creative challenges, ranging from online games and videos to mobile activities to create, share and rate personalized Despicable Me content. For each activity completed, players are rewarded with their very own, ever-expanding personal army of online Minions. As the total number of Minions grows, so does the player's chances of winning weekly and monthly prizes. The prizes also increase in value with each new Minion population benchmark level reached, escalating to as many as a whopping 100 $50 gift cards every week. In addition, iPhone-equipped players can participate in a special "Minion Photo Madness" event, a series of nationwide photographic missions, using a new Augmented Reality iPhone app available in mid-November. Players gain points and grow their Minion armies by photographing a series of designated landmarks around the country and personalizing their photos with characters and props inspired by Despicable Me using the iPhone app. The application also offers access to video clips, partners and pre-order links. Holiday shoppers and kids can submit photos taken at Minion photo displays located in the Santa Photo areas at over 170 Simon Shopping Malls nationwide starting in November- December 24. We are so excited to experience Despicable Me on DVD! The minion's are so CUTE! This is a definitely a film the entire family can enjoy, and a wonderful Gift this Holiday Season! Available at online retailer's and retailer's near you on December 14, 2010! 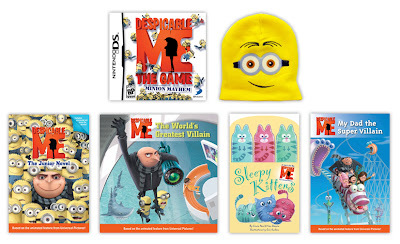 One Lucky Reader will receive a Despicable Me Prize Pack!! Leave a comment~ Let me know who you'd like to gift a copy of Despicable Me to this Holiday Season. The comment is considered your entry. 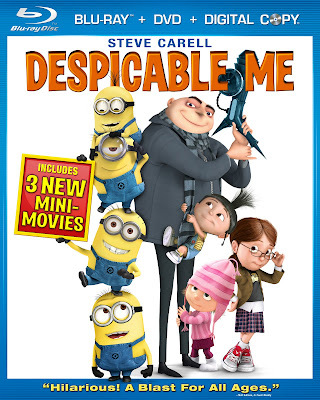 2) Tweet ~ #WIN a Despicable Me Prize Pack! Nintendo DS Game+4 Books+Minion Cap! @savvycouponmom http://bit.ly/dTJlqQ #GIVEAWAY #Holidays (can be repeated twice daily for additional entries~ copy paste please~cut and paste- the bit link must be posted in the tweet - I will check) (Additional 5 Entries - 5 Comments). Entry to this giveaway ends at 12pm PST December 13, 2010. Winner's are chosen randomly through random.org. The winner will be announced in a post within 7 days of the giveaway ending, and contacted through email. The winner will have 48 hrs. to respond or another winner will be chosen. I am a follower and I would love to give this to my son. I would love to win this prize pack for my 6 year old son. He saw the movie in the theater and loved it! He is also learning to read right now, so the books would be great! i follow and part of this would go to a friend one mine! I really,really want this for my 7 year old grandson! He is wanting it for Christmas. I would gift this to my nephew but save it for after the holidays. His birthday is in January. I also entered your Tot clocks giveaway! I subscribe to your feed through My Yahoo. I registered online as "masterminds"
I know my little boys would love this!! This would be really cool to win, my kids LOVE this movie and Hubby thinks they look like twinkies and my kids argue 'THEY ARE NOT TWINKIES" lol its so funny to hear.